Unlike the imposing mbl and Burmester DACs that I review elsewhere in this issue, the Mark Levinson No.360 is New England conservative in appearance. Its operation was simple to master despite the sophistication and flexibility on tap. Flanked by Fasolt and Fafner, the Levinson No.360 seemed as amiable as Freia. The Mark Levinson No.30 has enjoyed a continuing residence in Class A of Stereophile's "Recommended Components" listing since it was reviewed in our February 1992 issue (Vol.15 No.2). Madrigal includes the No.30 in its "Reference" series, by which they mean that the unit will not become obsolete. Thus, when new technology became available, the No.30.5 update was introduced, consisting of a single digital-receiver printed circuit board to replace the original's three boards, and a new digital-filtering board. 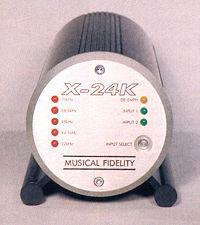 This revision was favorably reviewed by Stereophile in October 1994 (Vol.17 No.10). History teaches us that the full flowering of any social phenomenon takes place after the seeds of its destruction have been sown. That tourist magnet, London's Buckingham Palace, for example, was built decades after the English Revolution and the Restoration had redefined the role of the British monarchy as being merely titular, and made the elected Parliament the real seat of power. Things are changing rapidly in the world of professional digital audio. After a decade of stability, with slow but steady improvement in the quality of 16-bit, 44.1kHz audio, the cry among audio engineers is now "24/96! "—meaning 24-bit data sampled at 96kHz. Not coincidentally, DVD offers audiophiles a medium with the potential for playing back music encoded at this new mastering standard. We are now well past the era in which every review of digital playback equipment had to begin with an apology for the medium. CD replay performance may, in fact, now be bumping up against a glass ceiling. But that doesn't discourage high-end audio manufacturers from trying to advance the art, and tempt audiophiles (at least those among us who are not hopeless digiphobes) out of our minds.